Anthony B. Pinn received his B.A. from Columbia University, and his Master of Divinity and Ph.D. in the study of religion from Harvard University. He is currently the Agnes Cullen Arnold Professor of Humanities and professor of religion at Rice University. Pinn is the founding director of the Center for Engaged Research and Collaborative Learning (CERCL) also at Rice University. Pinn’s research interests include religion and culture; humanism; and hip hop culture. He is the author/editor of over 35 books, including The Black Church in the Post-Civil Rights Era (2002); Terror and Triumph: The Nature of Black Religion (2003), African American Humanist Principles (2004), Noise and Spirit: Rap Music’s Religious and Spiritual Sensibilities (2004), By These Hands: A Documentary History of African American Humanism (2001), Introducing African American Religion (2012), The End of God-Talk: An African American Humanist Theology (2012), and the novel, The New Disciples (2015). 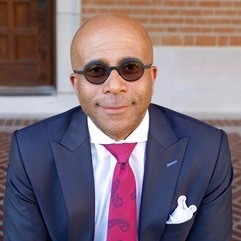 Pinn is active with numerous professional organizations, including service as a member of the American Academy of Religion’s Board of Directors; Executive Director of the Society for the Study of Black Religion; and co-founder of the Society of Race, Ethnicity and Religion. In addition, he is Director of Research for the Institute for Humanist Studies. Pinn is also involved with many community organizations, and has held leadership positions in a variety of them, including Meadville Lombard Theological School Board of Trustees (Executive Committee and Chair of the Education Team); Board of Directors for the American Humanist Association; and the Rothko Chapel Board of Advisors.